I'm a great user and adept of free software, but I must confess that I'm more attracted to the "free beer" side of things rather than the "free speech". 2. I patched Kannel. This was amazing because I did the patch at the same time someone asked for it on the mailing list. So I send it to the mailing list and it is now part of the Kannel code! I bought a Wacom Graphire 4! I'm an engineer, not a designer, but I do like to make the occasional drawing and I was on the lookout for a pen tablet for a while. I bought it yesterday and installing it was as smooth as you would expect... just plug it in and it works, add a few drivers and you can use all features (so far I only installed it on Windows). I was very happy to see that neither the pen nor the tablet need bateries. Just plug in to the USB port and everything is working. I installed Corel Painter Essentials 3 (it is bundled with the pen tablet) and started sketching. It's really awkward when you start, because you keep doing "mouse gestures" all the time. I raised my hand, moved it to the left and when I placed it down again I was surprised to see the pointer going way to the left instead of staying in the same place! 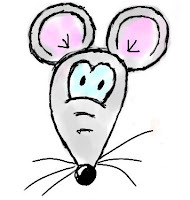 But I eventually got used to it and draw the mouse that you see here... My very first pen tablet drawing!